Grid computing as been “the power behind” many applications. Grid solutions have covered services from file sharing, to web serving, to high load algorithm execution. Grid architectures have been traditionally those of server farms and clusters. However, recent works try to use P2P networks in the construction of grids with highly distributed and heterogeneous computers. The MiniGrid project explores the possibilities of using grid technologies, with a P2P architecture, in the everyday workings of a molecular biology lab. Our efforts focus in the usage of the MiniGrid for executing parallel versions of DNA analysis algorithms. The P2P nature of the MiniGrid leads us to the problem of having a peer base big enough for the grid to offer a substantial advantage in terms of processing power. However, peers are managed by people, and this people need to be approached in order to have them join the grid. For this purpose I am exploring an interdisciplinary solution. Dragging elements from the Persuasive Technology and the Pervasive Computing fields, our Grid Awareness system proposal intents to persuade a research group to use the MiniGrid. The Grid Awareness system (the name might change) is a Multi-Display Environment (MDE) that builds on concepts from calm technology to show the level of activity of the grid at a given time. The system has a standalone screen, a public touch screen and a web interface. The target organization is a molecular biology research group made up of 30 researchers. The aim is to have the researchers use the grid due to the persuasive mechanism of the MDE system. The system will tap into the P2P network of the MiniGrid and continuously gather data about the grid usage. This data is later converted into graphics that reflect the level of activity in the grid. Initially, the Public Screen and the Web Interface components of the MDE will be deployed without using the grid. The researchers will see the drawings both in the corridors of their lab and on the web page, and they will have no information as what the drawings mean. After a week or two an initial group of 2 researchers will start using the grid services. As they use the MiniGrid the activity is reflected in the MDE system. Along with the new images a leaflet explaining the reasong for changes in the screen is made available, and instructions for how to join the MiniGrid. The MDE has to be designed and deployed in such a way that the researchers are motivated to join the MiniGrid so their activity is also reflected in the MDE. Intentionality Perspective: The grid awareness system described before would inherit both endogenous persuasive intent and exogenous persuasive intent. The endogenous intent is inherited due to own intent as technology designers to persuade the researchers in the group to use the MiniGrid services. The exogenous intent is inherited because of the desire and sponsoring of the group leaders to have the system persuade the researchers to use the MiniGrid. 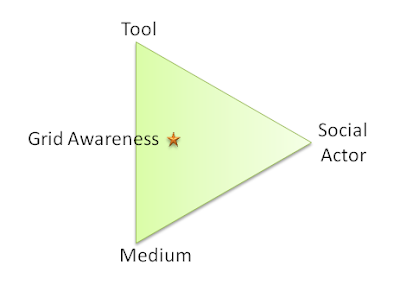 Functional Triad Perspective: The Grid Awareness system leverages the tool and medium persuasive technology areas. The system works as a tool as long as it allows the users to interactively monitor the state of the grid and get information about its usage and their participation in it. The system also works as a medium because it provides visualization mechanisms, promotes the understanding of cause/effect relationships and motivates by providing a “feeling” of the MiniGrid. Level of Analysis Perspective: The Grid Awareness system is targeted at the organizational level, due to being the research group as a whole the beneficiary of the adoption of the MiniGrid. This blog posts presented the Grid Awareness system that I am working for as part of my PhD. The system is grounded in concepts from Pervasive Computing and Persuasive Computing. And in the near future I will be publishing here more details regarding the design and implementation. January 29, 2009 in Infrastructure Awareness, Persuasive Technology.